B4310LF is rated 3.0 out of 5 by 42. Rated 5 out of 5 by Steve C from Excellent Warrinty We brought a unit similar to this one about 10 years ago. Recently water comes out at the handle base when turned on . 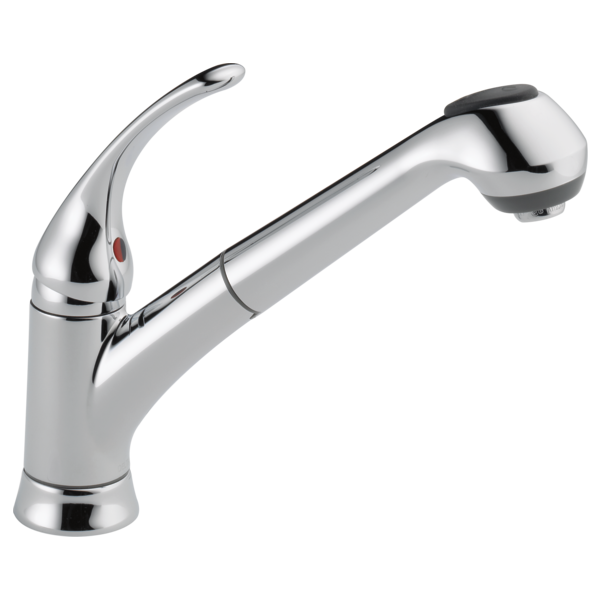 The finish has deteriorated at the faucet end. I talked with Onya, Saturday morning December 29, 2018 , described my issues , she helped me text her pictures of my unit and she placed a replacement parts order under my lifetime warranty . Always purchase where there is a life time warranty . Thank you DELTA. I'm a life long fan. Rated 5 out of 5 by NRay from Nice Profile Looks great on our new island. Rated 5 out of 5 by Marie57 from Very nice faucet! 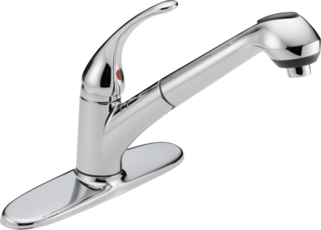 Purchased this faucet to replace a previously owned Delta. Was very similar in style and a good value for the money. Happy with my purchase! 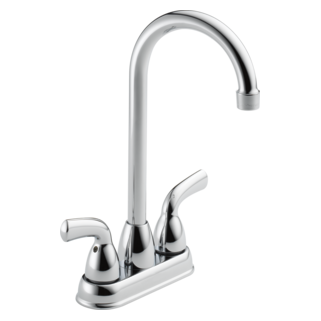 Rated 4 out of 5 by MSS3 from A single limitation Good faucet but its angle is too sharp to easily spray around a standard size sink. Otherwise, I'm a happy camper. Rated 1 out of 5 by tony from liked all the features until 8 months later. 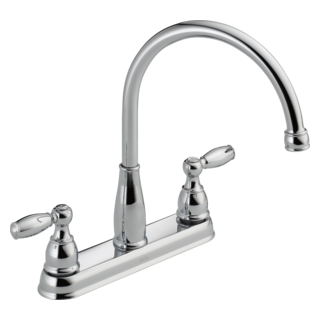 contacted delta and was sent a replacment kit for thefaucet and two months later im having the same problem and more then one thing that started out with. if this a lifetime replacement on parts ..then why not send me a new replacment faucet since this is costing me to have installed. Rated 1 out of 5 by Don T from Replaced twice and wand replaced once. We are not happy with the Delta Foundation single handle pull out kitchen faucet. This is the second time this unit has been replaced and the sprayer wand has been replaced recently. We are both handicapped and have to installation done be a plumber. The unit was purchased new in 2/2013. Lot of cost involved with installation of a new unit under warranty. Rated 5 out of 5 by TomG201 from Perfect fit Looks good and works as stated on box. More importarly, wife loves it. Is this faucet suitable for use in an outdoor kitchen on a covered patio? Does the Foundations Pull Out faucet spout swivel? 1) What does the letter &quot;B&quot; in model Number stand for? 2) I have a three (3) hole sink. Any reason why I could not install this model using the 1-hole method? Wouldn't the 8-inch escutcheon plate cover the water faucet holes spaced 4-inch apart? 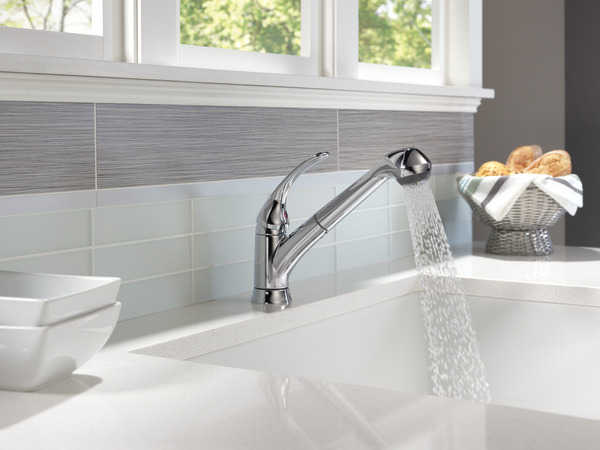 Which line is for the hot water? The long or the short hose? Is this model lower end quality or lower end of middle price quality?